The story of Boutique Blends Cigars has been of reinvention, miscalculations, persistence and eventual triumph—all by the hands of Rafael Nodal, Alina Nodal and Hank Bischoff. The Habana Cuba Cigar Company was founded in 1996 as the non-Cuban manufacturer of the historic Cuban “Oliveros” brand. The timing was less than ideal. The late-90s marked the “Downward side of the cycle of cigar boom”, when the supply of premium cigars began to surpass the demand. Habana Cuba Cigar had a plan—flavored cigars and an internet-based selling strategy run by Rafael Nodal and Hank Bischoff. In 2002, when Habana Cuba Cigar Company was for ‘sale’, Nodal and Bischoff were a natural fit, entering into a partnership and purchasing the company alongside Rafael’s wife, Alina. Nodal is the first to admit that Boutique Blends hasn’t always been the smoothest ride. The first step was to shift focus away from the unprofitable flavored cigar niche towards premium hand-rolled cigars. In 2005 and still under the Habana name, Nodal and team released XL for Men. They may have been ahead of their time as thick ring gauges (like XL’s) were not common practice and were tailored to a niche market “of” experienced cigar smokers. Instead, XL for Men was pushed for the mass market. This coupled with inconsistencies in quality pushed XL for Men out of production. The next line, Oliveros King Havano, was better received and was Boutique Blend’s first step in the European market and their most successful cigar to date. However, their decision to sell in catalogs as well as brick & mortar stores undermined the cigar’s value. Nodal and team returned to the drawing board to search for new ideas and better niches. Rafael, Alina and Hank took their miscalculations and learned from them—ultimately realizing they had an opportunity with the under represented boutique cigar market. Still made under the Habana Cuba Cigar Co. name, Swag was the step in the right direction with a focus on specialized, small batch cigars. They returned to the Dominican Republic for inspiration, coming up with a spicy, Cuban-seed puro that was 100% Dominican leaf. After being well received, Swag’s success reinforced the company’s decision to move towards smaller, specialized cigars. During production for Swag, the team found a combination of flavors that while great, were too limited for their first release. 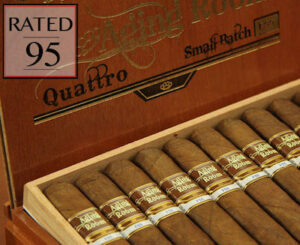 After the success, the team used M356 for their Aging Room cigar. The combination was from a single farm in the Dominican Republic and featured a strong and more complex flavor. After gaining recognition and a spot on Cigar Aficionado’s Top 25, the company’s decision to focus on small batches was solidified with their main focus on the Aging Room brand. Ultimately, Habana Cuba Cigar Co. was rebranded and renamed, Boutique Blends Cigars to recognize their success and change from their formative years. Boutique Blends Cigars was here to stay. The releases of Boutique Blends have been well received by consumers and critics alike with consistent ratings that range from 90 to 95 by Cigar Aficionado, Cigar Insider, Cigar Journal, and other specialized publications around the world. Aging Room Quattro F55 Concerto is the Number 2 cigar of 2013 by Cigar Aficionado, making it the number 1 rated cigar available in the USA. Interested in trying one of Boutique Blends Cigars unique, handcrafted blends? Here is their list of currently available collections.